If you are a classic film buff and Turner Classic Movies fan on Twitter or Google+, you may be familiar with Jennifer Garlen. Jennifer is the author of the blog Virtual Virago. What you might not know is that she recently published a book, Beyond Casablanca: 100 Classic Movies Worth Watching. Beyond Casablanca: 100 Classic Movies Worth Watching is a compendium of 100 reviews of classic movies that might be worth one's while. Included at the beginning of the book is a list of ten films that Jennifer considers essential viewing. Beyond Casablanca: 100 Classic Movies Worth Watching is a very easy reference to use. The movies are listed in alphabetical and there are also indexes that list the films by year, by director, and by actor. Not only is Beyond Casablanca: 100 Classic Movies Worth Watching easy to use, but it is also very to read. What is more her reviews are very informative. Not only does she have some very insightful views on the various films, but she also dispenses a good deal of trivia as well. If you have ever read her blog, then you know that Jennifer knows her classic films. And while there are only 100 movies reviewed in the book, in the vast majority of reviews Jennifer mentions other films in which the viewer might be interested (for instance, in her review of Hammer Films' Dracula, she not only points the reader to other Hammer films, but similar horror films such as House of Wax, Night of the Demon, and so on. 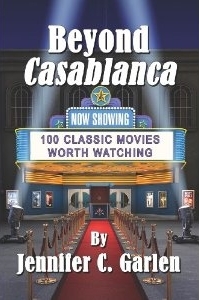 I must also mention that Beyond Casablanca: 100 Classic Movies Worth Watching has a good mix of various genres. One will find serious dramas, swashbucklers, science film movies, musicals, Silent films, and just about any other genre of which one can think. My only real caveat with Beyond Casablanca: 100 Classic Movies Worth Watching is that Jennifer did not include my "Film That One Must See if He or She Sees Only One Film in His or Her Lifetime", Seven Samurai. To me it is the greatest film of all time. Of course, this points to the fact that film viewing is a subjective experience. What one person to be an essential film another might not. That having been said, the fact is that there are no films in the book that I don't think deserve to be there! Beyond Casablanca: 100 Classic Movies Worth Watching is not simply a great reference for those just beginning to explore the vast world of classic film, but a book that can also be a source of discussion among veteran classic film buffs. Whether you're just starting to watch the classics or have seen the vast majority of them, Beyond Casablanca: 100 Classic Movies Worth Watchingis a very worthwhile book to purchase.